Farmers, gardeners, growers, and landscapers love Valley Mushrooms’ compost because it makes a terrific soil conditioner for lawns, gardens, and flower beds. The high-organic matter allows the soil to retain moisture in dry weather and shed it during wet weather. Characterized by a coarse texture, brown colour, and a sweet smell. It is suitable for use as mulch, or can be incorporated into the soil as any other compost. This is the kind of compost that our delicious mushrooms grow in. Characterized by a fine texture, black colour, and a pungent, earthy smell. It is produced by aging the spent mushroom substrate (SMS) for several months. Weathered material is better for greenhouse use, for sensitive plants or top dressing of lawns. Both types of compost have a pH of 6.5 to 7.5. 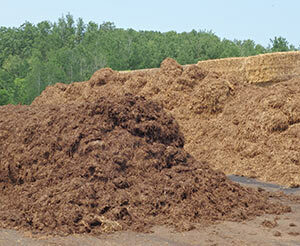 Our mushroom compost is available for purchase in bulk by the cubic yard. Contact us to place an order. There are more amino acids in mushrooms than in corn, peanuts, or soybeans.